Progress is typically defined by forward momentum. Is a company moving forward? Is a person moving on? Is an organization taking progressive steps? The question should really be, is growth taking place? 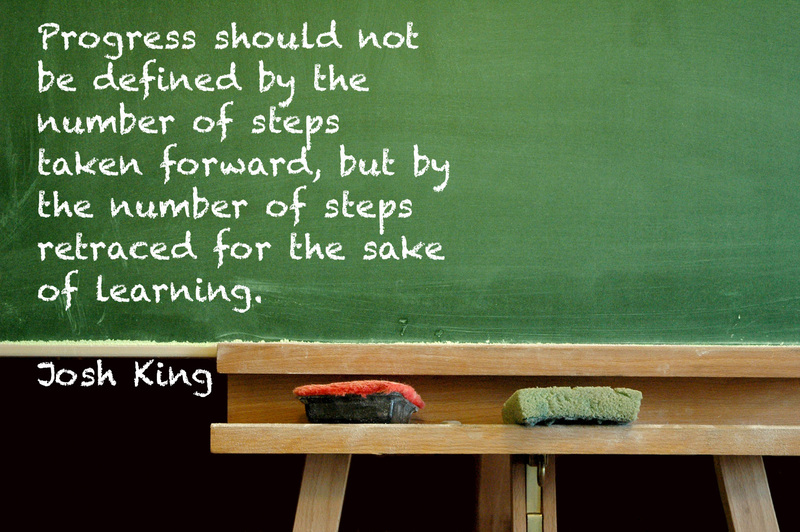 Progress should not be defined by the number of steps taken forward, but by the number of steps retraced for the sake of learning. Growth and progress always come with bumps and bruises. Mistakes will happen. External forces will work against us. Which means that sometimes, in order to achieve progress, reflection on those mistakes must take place. Although the goal should be to avoid as many mistakes as possible, they will happen. Progress will only take place when learning from those mistakes has occured. Thomas Edison said it best, “I have not failed. I’ve just found 10,000 ways that won’t work.” With each failed attempt, Edison couldn’t just start over. He looked at what was done, why it didn’t work, and then tried again. Progress.